There is a theory in America called the Most Royal Candidate theory. This is a term given to the fact that every presidential election, except one, in the United States has been won by a candidate descended from King John Lackland Plantagenet. The theory further suggests that the presidential candidate with the most number of traceable royal ancestors wins the election. Of course this theory has met a lot of criticisms. But regardless if this theory actually makes sense or not, one thing is for certain: proximity and access to the base of power - in this case to "royalty" - is almost always a sure win for the candidate. 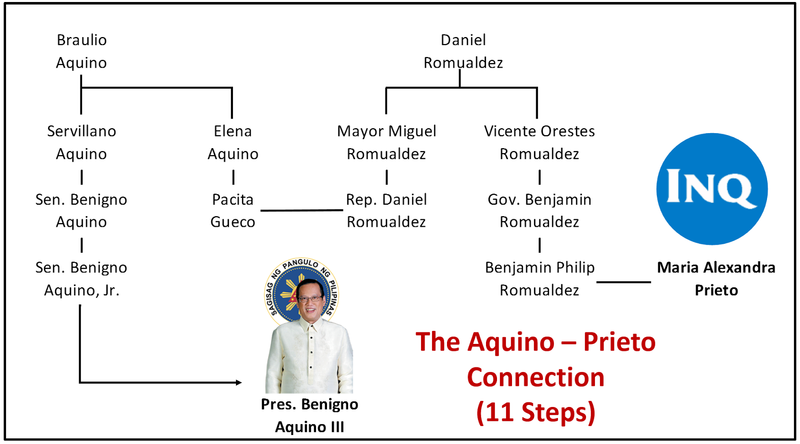 In a previous article, which took me about 5 years to complete and revise many times, I illustrated the interconnectedness of Philippine politics: from Aguinaldo to the BS Aquino several lines of relationships, whether by marriage or blood or both, connected most of those who are in power. Now, many years after that article was first conceived, I have yet again found more interesting connections between and among all 16 of our presidents. It is admittedly an accepted fact that everyone is connected one way or another, whether by Six Degrees of Separation of through genealogy. But I am still amazed at the connections I saw once I put together the family trees of all 16 of our presidents. In this article, I propose the Genealogy of Power principle where we will see which of our presidents and other prominent figures have the strongest connections with the bases of power. This is different from the Six Degrees of Separation principle, which states that in most instances two people can be connected to each other by six degrees or less. For instance, the friend of Baste Duterte, the son of PDU30, is connected to former dictator Ferdinand E. Marcos by just 4 degrees since Digong's father, Vicente, knew President Marcos personally and even worked under him. My Genealogy of Power principle depends only on the genealogical connections of people which often means more in this country than anywhere else. 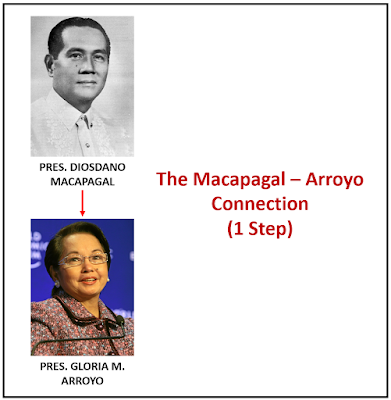 Presidents Diosdado Macapagal and Gloria Macapagal Arroyo are connected just by 1 relationship as seen in the matrix above because Diosdado was GMA's father. FVR and Duterte are separated by 23 connections. 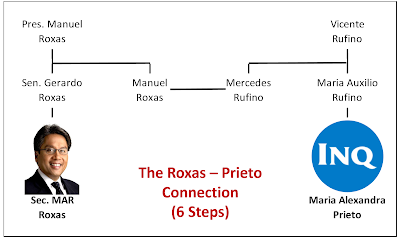 And since FVR and Ferdinand Marcos were cousins, we can also connect PRRD with Marcos, both of whom are connected by 18 steps. Among the 16 presidents, the 2 with the farthest genealogical connection are Presidents Quirino and Garcia. 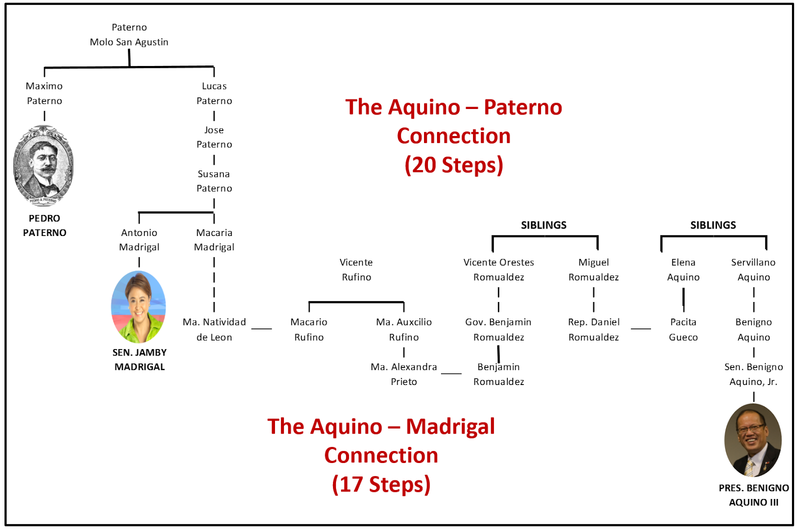 The two presidents are connected distantly through 38 relationships (in genealogy speak, President Elpidio Quirino is the brother of the father of the father of the husband of the daughter of the brother of the father of the wife of the son of the sister of the mother of the husband of the sister of the husband of the sister of the wife of the son of the brother of the father of the husband of the daughter of the wife of the son of the brother of the husband of the daughter of the daughter of the daughter of the brother of the wife of the brother of the father of the wife of the brother of the mother of the husband of the sister of the wife of President Carlos P. Garcia). You get my drift, then. 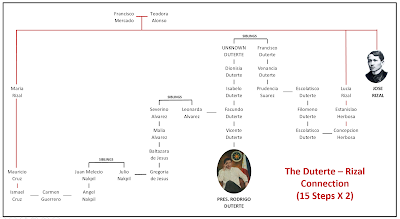 Because all presidents have full genealogical data available on them, we can assign the relationships of all the presidents from Aguinaldo to Duterte. See the illustration below to see just how interconnected all our presidents are. As seen in the genealogy of power matrix, colors have also been assigned to the closeness of relationships aside from number. For example, Marcos and Ramos are connected through just 5 relationships, being 2nd cousins, thus making their relationship extremely high and thus shaded red. Same with Aguinaldo and Aquino, who have very close relationships. If we were to assign this "genealogy of power" relationships to all 16 presidents, we get some very interesting insights. 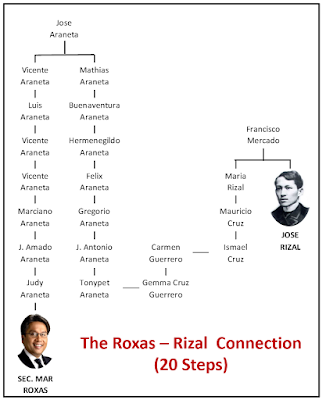 The top 2 most "powerful" families using our genealogy of power matrix are Marcos and Roxas. 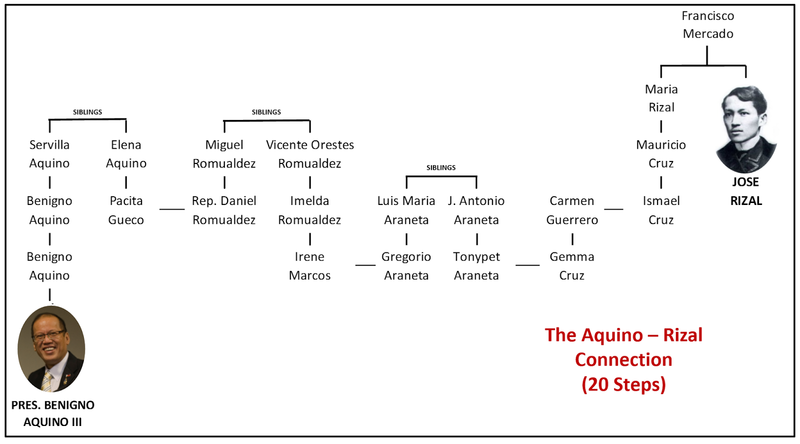 The Marcos family, on average, is separated from all presidents by just 12 connections, while the Roxases just by 16. 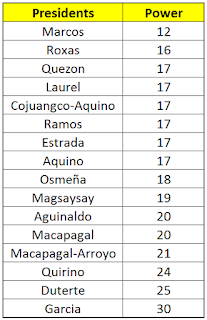 Tied on third "most powerful" spot are the Quezon, Laurel, Cojuangcos, Aquinos, Ramoses, and Estradas. Simply put, most, if not all, of these families are what we can consider strongly related to the bastions of power in imperial Manila. 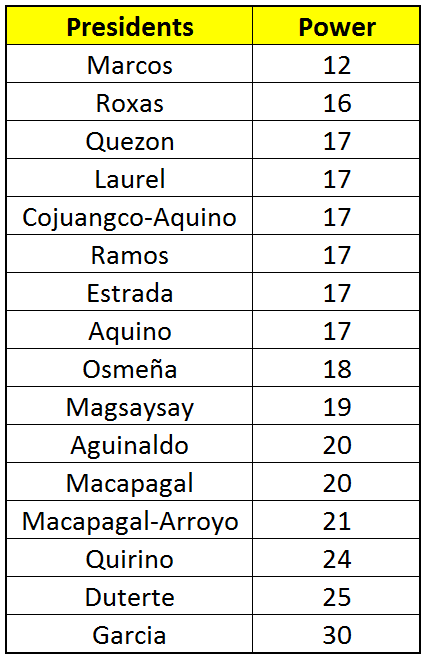 On the opposite side, we can see that Quirino, Duterte, and Garcia are the last 3 families with close proximity to power. 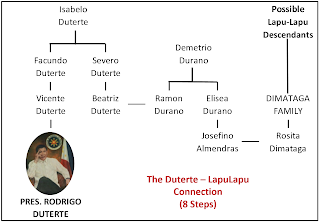 Thus, it is clear that our current president, Rodrigo Duterte, is truly far removed from the cluster of powerful families, separated on average by 25 relationships to any of the presidential families. If we are to check the connection of President Digong, PNoy, and Mar Roxas with Maria Alexandra Prieto, CEO of broadsheet Philippine Daily Inquirer, we can see that the connections are 21, 11, and 6, respectively. When connecting with Gabby Lopez of ABS-CBN, the connections are 22, 9, and 11, respectively. 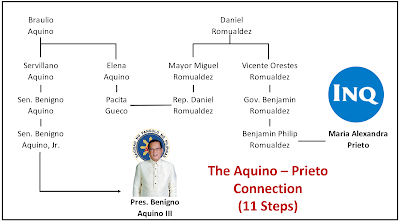 And, if we want to see their relationship with Benjamin Philip G. Romualdez, who has deep connections to mining, the connections are 20, 10, and 7. Clearly, no matter how you look at it, President Duterte is a true outsider of imperial Manila. He is also so far removed from the oligarchs, as seen in his 20 or more connections that separate him from the Philippine Daily Inquirer (PDI), ABS-CBN, and the mining industry. PNoy and Mar, on the other hand, are very close to these symbols of Philippine oligarchy. "Remember, Paterno was one of the greatest "balimbing" (turncoat) in history (perhaps he was the original "balimbing" in Philippine political history). He was first on the Spanish side, then when the declaration of independence was made in 1898, he "wormed his way to power" and became president of the Malolos Congress in 1899, then sensing the change in political winds after the establishment of the American colonial government, he became a member of the First Philippine Assembly." And since Pedro Paterno is related by blood to former Senator Jamby Madrigal who recently made news when she was accused of trying to bribe the inmates who accused Senator Leila de Lima of protecting the drug trade in Bilibid prisons, she will also be connected in the charts. 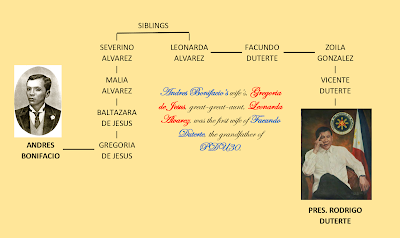 Obviously, once again, President Duterte is quite distantly related to the Paternos and Madrigal, two of the richest families in the Philippines even since the Spanish period. No wonder, then, that various nefarious groups and individuals have been seeking for PDU30's ouster left and right. For the first time in our history since another outsider, Carlos P. Garcia, was president, an ordinary man has been given the mantle of power by the Filipino people. This is why they want Duterte out. These people, whose genealogies situate them near the power bases, believe that they have the monopoly of ruling the country. As the genealogy of power matrix shows, those who are closely related have ruled this nation for most of our history. Duterte, who is too far removed from these powerful clans and oligarchic institutions, is a real threat to these people. But what they do not know is that not only does Duterte have the support of the ordinary citizens, he too has the historical mandate based on his connections to our heroes. I was also playing around with another theory when I wrote this article. I surmised that a "good" president is nearer genealogically to Philippine heroes. So, I chose Jose Rizal, Andres Bonifacio, and Lapu-Lapu and connected them with PDU30, PNoy, and MAR. And the results were truly amazing! When connected to Andres Bonifacio, arguably the favorite hero of our leftist brethren and considered by some historians as the rightful first president of the Philippines, we see that hands down, President Duterte is the closest. He is 8 steps away from Andres Bonifacio, whose wife's great-great-aunt, Leonarda Alvarez, was married to Facundo Duterte,President Digong's grandfather. PNoy is a distant 21 steps away while MAR is 18 steps from Bonifacio. 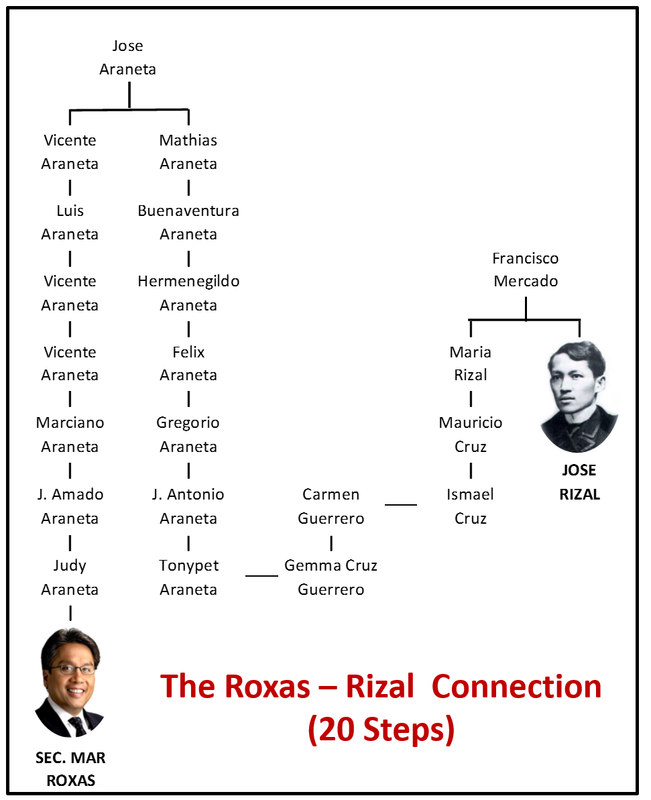 And when connected to Jose Rizal, we still get the same result. 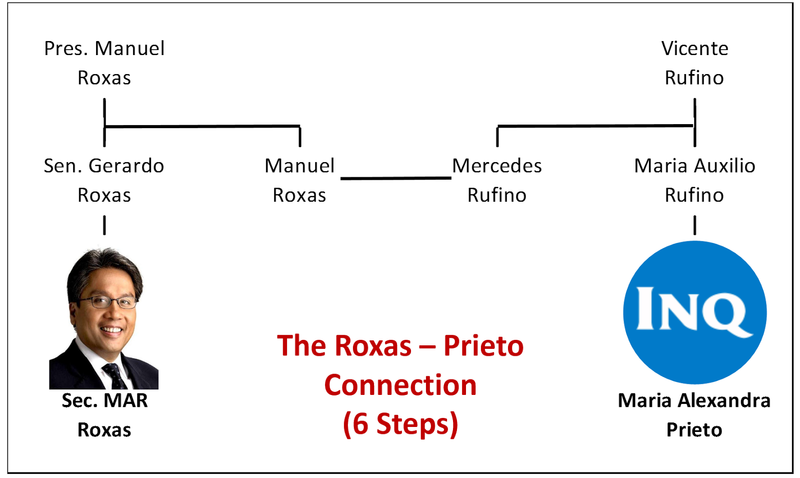 President Duterte is still the one with the nearest connection, with 15 steps away but double the connection this time; meanwhile, both Aquino and Roxas are 20 steps away from the Philippine national hero. While Lapu-Lapu is known as the first hero of the Filipinos, very little of his genealogy is actually known. What we do know today is that some old families in Mactan are serious about their claim of being descended from them. One of these is the Dimataga family. So this family will be our basis in our connections. It does seem fantastical and far-fetched, but the genealogical charts do not lie. 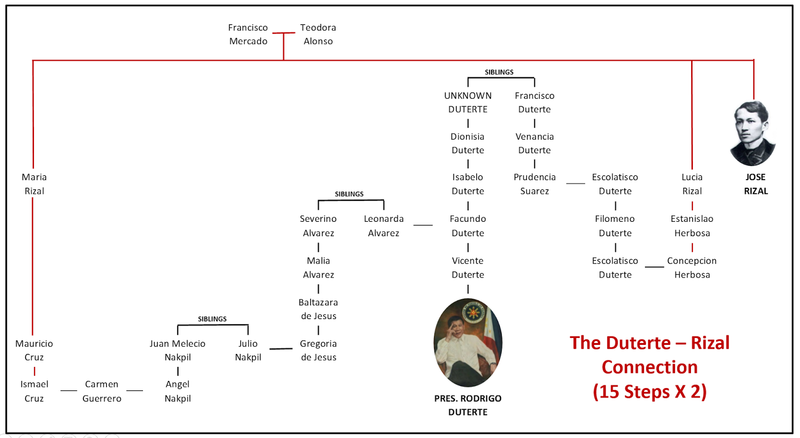 Digong is the president with the nearest connection with our heroes with just 8 steps away from Andres Bonifacio, 15 from Jose Rizal through double connections, and just 8 connections apart from the Dimataga family of Mactan, one of the families believed to be descended from Lapu-Lapu. 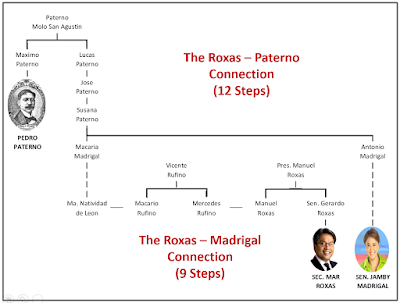 PNoy, on the other hand, is 21, 20, and 31 connections apart from the 3 aforementioned heroes, while MAR is 18, 20, and 31 steps away! Rodrigo Roa Duterte may not be to the manor born and may be too far removed from the country's ruling elite, but among all presidents, he is the one with the closest connections to Lapu-Lapu, Rizal, and Bonifacio. Men who fought not just for the ruling class, but for every single Filipino. In the end, it is clear that history has chosen Duterte to be the inheritor of the greats of our past. It means all Filipinos have learned that oligarch power is no longer exist, it has the people who has the power to put a real leader in this world. If still control by the oligarch which is one of the major causes of corruption, this country will face the consequence of corruption for a life time of existence. Amazing. 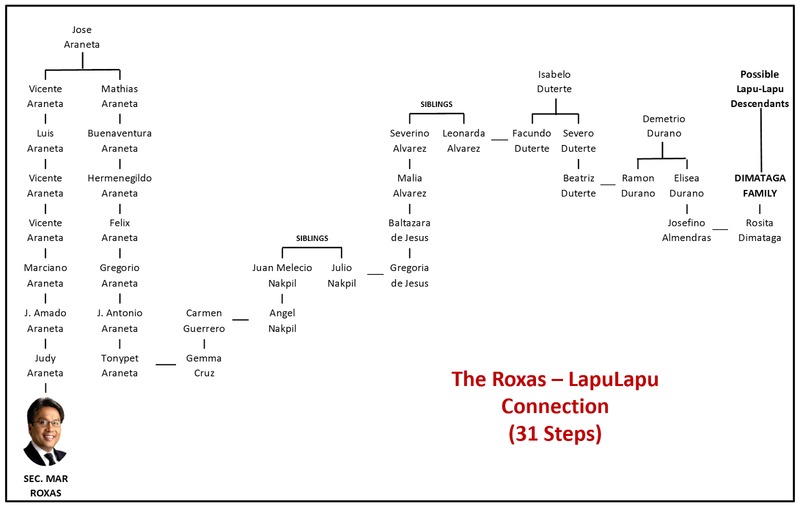 Can you please also include the visual mapping of their connections to Lapu-Lapu and Rizal? Thanks and Kudos! Sure, will edit this over the weekend. "I propose that the closer a president is to the base of power, the less effective he or she is"
-read till end yet see no evidence for this. Yup realized that I was unable to do that. Was thinking of doing it but the article took me elsewhere. I have deleted that already, thank you for pojnting it out. Very interesting theory. I think you can publish this in a scientific journal. Thanks! But this is really just a fun and relaxed way of looking at politics. Amazing and interesting entry. The current president is really the outsider. Hi. This is very interesting! Good job. Am a business analyst and I also work with an international humanitarian and development organization. Am offering my free service to make a more sophisticated data visualization of your excel data using Power BI. I'll only share the link to you and up to you to share it in public. Hi @aaronyap! Thanks for your kinds words. 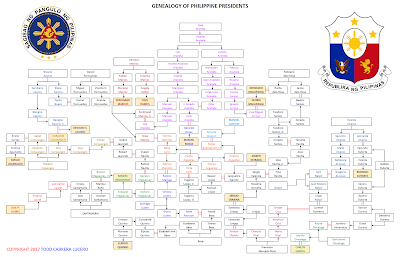 Genealogies of most prominent Filipinos are found on most online genealogical sites like Geni, MyHeritage, and TribalPages. However, in some cases, you do have to do a lot of google searches to get the names and connections. Everything really is available online now. Hahaha, you flatter me. Thanks! I really am just passionate about genealogy, and the subject of this article as well. Keep on reading my articles and share it with your friends. Hi sir i am the great grandson of Gregoria dr Jesus. Rhis is an amazing research. One minor correction. Anghel Nakpil's father is Ramon Nakpil. 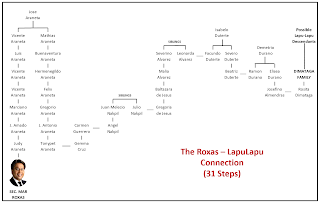 From duterte to roxas you can also take the route of gregoria de jesus youngest daughter, my lola, who is married to Carlos santos-Viola of San Miguel bulacan. Related to Trinidad de Leon- Roxas. Same line just change tweetums to Cory Quirino.